The following services and resources are available to Georgia citizens. Operates two cafeterias on Capitol Hill and the surrounding areas. Distinctive Capital Caterers operates six banquet/meeting facilities on Georgia's Capitol Hill Complex. The Georgia State Capitol and the Governor's Mansion offer tours for the public. Online tool for reporting incidents involving the use of State of Georgia government vehicles. The public can request to schedule the temporary use of the Capitol building's North Wing, South Wing and Rotunda. 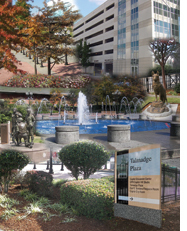 Outdoor plaza area located at 65 Martin Luther King, Jr. Drive, next to Underground Atlanta.